Members of the genus Sarcocaulon are spiny, fleshy shrublets with delicate white, yellow, salmon-pink or pink petals ('flowers'), confined to South Africa and Namibia. Sarcocaulon is a genus of succulent, spiny shrublets with short stems, branching just above soil level. The fleshy branches are prostrate, semi-erect or erect, covered with waxy, translucent bark. Dimorphic (two forms) leaves characterise the genus, with the blades either long or shortly petioled. The long petioles occur singly and remain as blunt or sharp spines, and the short ones occur singly or in groups of 2-7 in the axils of the long spines as blunt stalks. The leaf blades are often folded, unsegmented or segmented, and vary in outline from elliptic to ovate to obovate (egg-shaped with the broadest part above) with the bases usually tapered. The tips are notched and the margins entire, lobed or toothed. The flowers, subtended by 2 bracts, appear solitary in the axils of the leaves. They are pedunculate (stalked), 5-merous with the sepals of the calyx and the petals free. The margins of the sepals are membranous and the tips end abruptly in a short, stiff point. The thin, delicate petals are inversely egg-shaped (obovate) to almost squared off (subtruncate) at the tips and wedge-shaped at the bases, usually glabrous, sometimes covered with soft, short, erect hairs or fringed with hairs along the edge. Fifteen stamens, 5 with long filaments and 10 with shorter filaments, are characteristic of Sarcocaulon. Members of the Geraniaceae family have a peculiar dry fruit with the carpels much elongated. At maturity only the inner parts of the united carpels remain as a central column, whereas the outer part of each carpel, enclosing one seed at the base, lifts off. In Sarcocaulon the seeds and the sterile upper part of the carpel become completely detached. The tail is thin, readily absorbs moisture (hygroscopic), and has long weak hairs (villous). The Geraniaceae family is widely distributed and consists of mainly annual or perennial herbs and shrublets, comprising about 700 species. Members of Sarcocaulon are mainly found in the western part of South Africa and Namibia (see map). The most widespread species is S. salmoniflorum, and S. vanderietiae is the species with the most easterly distribution. One species, S. mossamedense, also occurs in Angola. The name Sarcocaulon alludes to the Greek words for fleshy, sarkos, and stems, caulon. The genus Sarcocaulon was established by A.P. de Candolle in 1824 as a section of the genus Monsonia, described by Linnaeus. Two years later, Sweet raised the section to genus level, followed by Knuth in his monograph of the family Geraniaceae in 1912. The account on Sarcocaulon here is based on the excellent study and revision of the genus published by Rodney Moffett in 1979. Although the genus is closely related to Monsonia, it is regarded as a sister genus and not a synonym of Monsonia. Species of Sarcocaulon occur in regions where dry climatic conditions prevail, and are found on rocky hillsides or mountainsides, gravel, outcrops of weathered quartzite and red dune sands. 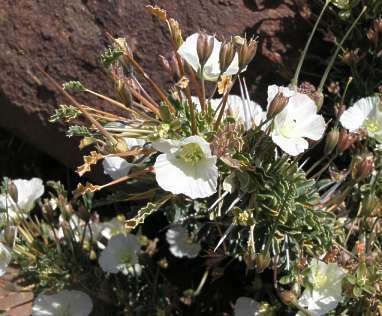 S. patersonii, for example, inhabits the extremely arid desert area between Port Nolloth and Lüderitz. Members of the family Geraniaceae have long been widely cultivated for their horticultural value. Members of Sarcocaulon are much sought after by succulent lovers. The fleshy branches, covered with wax, are flammable and even when wet can be used as a kindling to light fires. According to Charles Craib (1995), Sarcocaulon species are generally easy to cultivate. He says most species, with the exception of S. camdeboense and S. vanderietiae, rarely produce an extensive new root system once they have been transplanted. Transplanted specimens flower sporadically in cultivation, but survive for many years. Seed-grown plants, in contrast, thrive and flower prolifically in cultivation. The ideal cultivation medium for most species is silt collected from the sides of road culverts, to which a small amount of bone meal and some ordinary sandy garden soil has been added. Seeds should be sown just under the surface of the soil, in large seed trays. They should be planted out into individual containers when they are about two years old. All Sarcocaulon species require direct sunlight when in full growth. Seedlings need to be regularly watered whilst they are in active growth and occasionally during dormancy. S. salmoniflorum has a good deal of potential for the landscaping trade. The species is easily and relatively quickly grown from seed and long lived (Craib 1995). Sarcocaulon comprises 14 species, divided into four main groups (sections) by Moffett (1979). This division is based primarily on the nature of the leaf margin, a feature Moffett considered to be ecologically stable in the genus. The resulting grouping appears to be natural, and further similarities within the groups are the glabrous leaves in section Sarcocaulon, the puberulous leaves and yellow flowers in section Crenatum, the undulate leaves and pink to purple flowers in section Denticulatum, and the hairy leaves in section Multifidum. S. l'heriteri Sweet: erect shrublet, up to 0.75 m high; branches usually less than 10 mm wide; leaf blade broadly obovate to flat with a ± circular outline (orbicular), 4-15 ´ 3-11 mm, pale bluish green (glaucous), hairless (glabrous); spines thin and straight, 2-4 blunt stalks in axils of spines; petals 16-26 mm long, yellow to lemon yellow. (Northern Cape Province). S. patersonii (DC.) G.Don: semi-erect shrublet, up to 0.5 m tall; branches usually more than 10 mm wide; leaf blade narrowly to broadly obovate, 5-26 × 4-16 mm, glabrous; spines thick and straight, 2-5 blunt stalks in axils of spines; petals 15-30 mm long, rose, pale magenta or purple. (Namibia, Northern Cape Province). S. salmoniflorum Moffett: erect to semi-erect shrublet, up to 0.5 m tall; branches rarely more than 4 mm wide; leaf blade narrowly to broadly elliptic, 2-10 × 3-5 mm, glabrous; spines curved or straight, thin, 1-3 blunt stalks in axils of spines; petals 9-17 mm long; salmon-pink. (Namibia, Northern and Western Cape Provinces, Free State). S. camdeboense Moffett: semi-erect shrublet, up to 0.4 m tall; branches 4-10 mm wide; blade narrowly obovate to elliptic, 5-12 × 3-6 mm, glabrous, spines thin and straight, 2-5 blunt stalks in axils of spines; petals 10-15 mm long, pale yellow. (Northern and Eastern Cape Provinces). S. vanderietiae L. Bolus: low-growing to prostrate shrublet, up to 0.15 m tall; branches 4-10 mm in diameter; leaf blade broadly elliptic or obovate, 8-14 × 6-8 mm, apex toothed, glabrous; spines thin and straight, minute tufts in axils of spines; petals 10-20 mm long, pale pink to white suffused with pink. (Eastern Cape Province). S. crassicaule Rehm: erect shrublet, up to 0.5 m tall; branches usually more than 10 mm wide; leaf blade narrowly to broadly obovate, 6-25 × 4-16 mm, margin crenate, slightly hairy (puberulous); spines straight or slightly curved, thick, 1-4 blunt stalks in axils of spines; petals sulphur to pale yellow. (Namibia, Northern and Western Cape Provinces). S. ciliatum Moffett: low-growing shrublet, up to 0.18 m tall; branches usually less than 10 mm wide; leaf blade narrowly to broadly obovate, 8-23 × 4-16 mm, incised halfway to midrib, slightly hairy; spines straight and thin, 1-3 blunt stalks in axils of spines; petals 11-20 mm long, apices ciliate, primrose yellow. (Northern Cape Province). S. flavescens Rehm: erect shrublet, up to 0.4 m tall; banches less than 10 wide; leaf blade ovate to orbicular, 7-18 × 6-13 mm, incised less than halfway to midrib; spines thin and straight, 1-3 blunt stalks in axils of spines; petals 14-17 mm long, primrose yellow. (Namibia, Northern Cape Province). S. marlothii Engl. : erect shrublet or large shrub, up to 1.4 m high. Branches thick, up to 80 mm in diameter in old plants; blade broadly ovate to orbicular, 9-19 × 10-28 mm, margin minutely toothed, undulate, glabrous; spines curved towards apex, stalks blunt and swollen; petals 8-21 mm, dark rose to purple. (Namibia). S. mossamedense (Welw. ex Oliv.) Hiern: low-growing shrublet, up to 0.3 m tall; branches rarely more than 25 mm wide; leaf blade broadly ovate to orbicular, 12-29 × 10-29 mm, glabrous; margin finely toothed; spines curved towards blunt apex; petals 17-26 mm long, rose with white throat. (Namibia, also in Angola). S. inerme Rehm: dwarf shrublet, up to 0.3 m tall; branches 10-20 mm in diameter; leaf blade obovate to broadly obovate, 7-39 × 4-18 mm, upper surface glabrous, lower surface densely covered with short, soft felted hairs (tomentose), margin minutely toothed; spines absent, long petioles disarticulate low down to leave persistent blunt stalks up to 6 mm long, 1-3 short, blunt stalks in axils of longer stalks; petals 14-27 mm long, rose pink to purple. (Namibia). S. herrei L.Bolus: erect to semi-erect shrublet, up to 0.25 mm tall; branches wider than 10 mm; ; leaf blade broadly elliptic to broadly ovate, 6-30 × 6-19 mm, pubescent; spines straight and thick, 2-7 blunt stalks in axils of spines; petals up to 23 mm long. (Northern Cape). S. multifidum E.Mey. ex R.Knuth: semi-erect dwarf shrublet, up to 0.2 m tall; branches 10-20 mm in diameter; leaf blade broadly ovate to oblate, 8-24 × 12-34 mm, pubescent; usually spineless with rows of leaves or short blunt petiole bases; petals white, pale pink or magenta with crimson to dark red marks in throat. (Namibia, Northern Cape Province). S. peniculinum Moffett: dwarf, prostrate shrublet, up to 0.08 m tall; branches usually more than 20 mm in diameter, mostly only two per plant; leaf blade broadly ovate to transversely broadly elliptic (oblate), 5-26 × 9-30 mm, pubescent; spineless with two rows of leaves or blunt leaf bases; petals 16-24 mm long, rose to pale pink without marks in throat. (Namibia). Albers, F. 1996. The taxonomic status of the genus Sarcocaulon. South African Journal of Botany 62: 343-347. Craib, C. 1995. 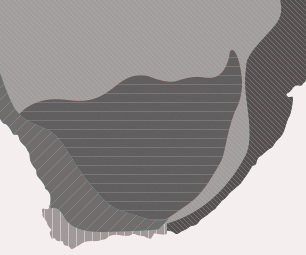 The Sarcocaulons of southern Africa. Hystrix: Natural History & Cultivation Series 1,3: 1–60. Dreyer, L.L., Leistner, O.A., Burgoyne, P. & Smith, G.F. 1997. Sarcocaulon : genus or section of Monsonia (Geraniaceae)? South African Journal of Botany 63: 240. Knuth, R. 1912. Geraniaceae. Das Pflanzenreich 4.129 (Heft 53): 1-640. Moffett, R.O. 1979. The genus Sarcocaulon. Bothalia 12: 581-613. Moffett, R.O. 1997. The taxonomic status of Sarcocaulon. South African Journal of Botany 63: 239, 240. Sweet, R. 1826. Geraniaceae. Hortus britannicus, edn 1. James Ridgway, London.